I needed to get an assortment of stuff (such as hinges, a door threshold, custom-cut metal plates, and wood shelves), so I went down to Jinwuxing yesterday. Fairly devoid of tourists (and, by that, I mean both the foreign and Chinese types), it is one of the places that makes Beijing home for me. 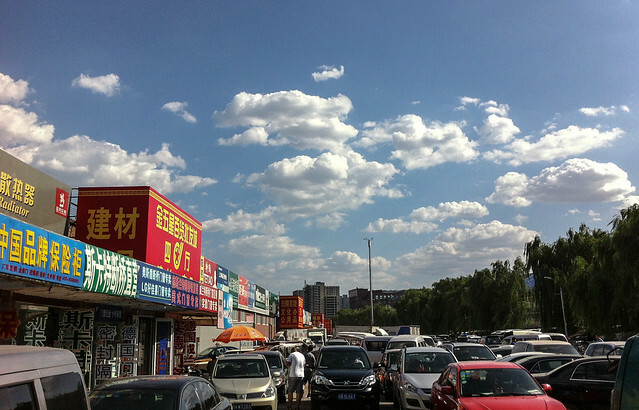 if you feel like it, can you enlarge on what it is about this place that helps make beijing home? beautiful sky, by the way. How do you shop there without fluent Chinese? Personally? I know enough Chinese at this point to do just fine. For others, they use calculators to convey prices.